sandpaper and silly putty: thanksgiving already?! I can't believe it's that wonderful time of year again! I always feel like I need an extra month just to prepare for the holidays and enjoy all the great times that this season brings. Of course, I'm not getting an extra month, so we're just cramming in as much fun and festivity as our little family can handle. With thanksgiving being next week, I'm off to the market to buy the necessary goodies. We're enjoying a nice family celebration as usual, and everyone brings their specialty. With my sweet tooth, I'm in charge of dessert. I know I'd be in BIG trouble if I skipped the apple pie (I better share that recipe soon - it's REALLY good) so it stays. But, this year I think I'll be swapping the good ol' pumpkin pie for a lemon meringue. Our family just isn't crazy about pumpkin pie and my meyer lemon tree has SO many ripe lemons right now, it just feels like the right thing to do. 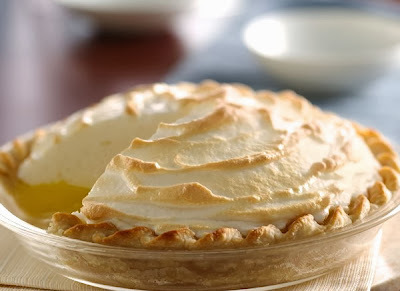 Plus, I've got my grandma's lemon meringue pie recipe that just can't be beat. 2. Stir in lemon juice, zest, and remaining water. 3. Stir often until mixture come to a boil. 5. Beat yolks and gradually add in 1/2 cup of the hot sugar mixture. 6. THEN add eggs to the mixture. 7.Whisk egg yolk mixture back into sugar mixture. 8. Bring to a boil and continue to stir constantly until thick. 9. Remove from heat, cool and add mixture into baked shell. 1. In a large glass or metal bowl, whip egg whites until stiff. 2. Add 6 tablespoons of sugar. 3. Place on pie (swirl it around with the back of a spoon to make decorative peaks and valleys). Bake at 325* for 10 or so minutes until meringue is golden on tips. I just hit publish and the comment went away...any who, that lemon meringue pie sounds and looks delicious. I'm a huge pie fan.